A cover letter is a good addition to a resume. A resume tells about your qualifications, skills, and work experience but it is a cover letter through which you personally introduce yourself. Using a cover letter you can tell about your personal reasons for applying for a job and why you think you would be a good fit for it. 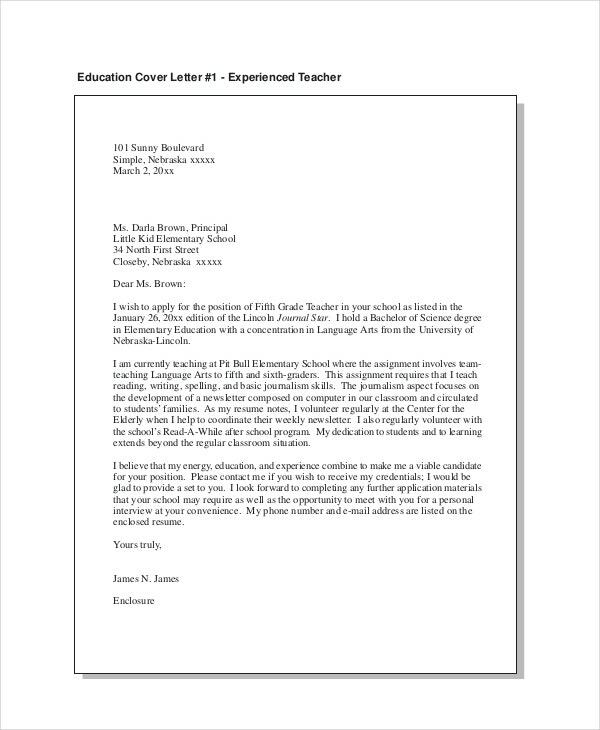 If you are looking to apply for a teacher’s job then you can benefit by using the below-given teacher cover letter examples. 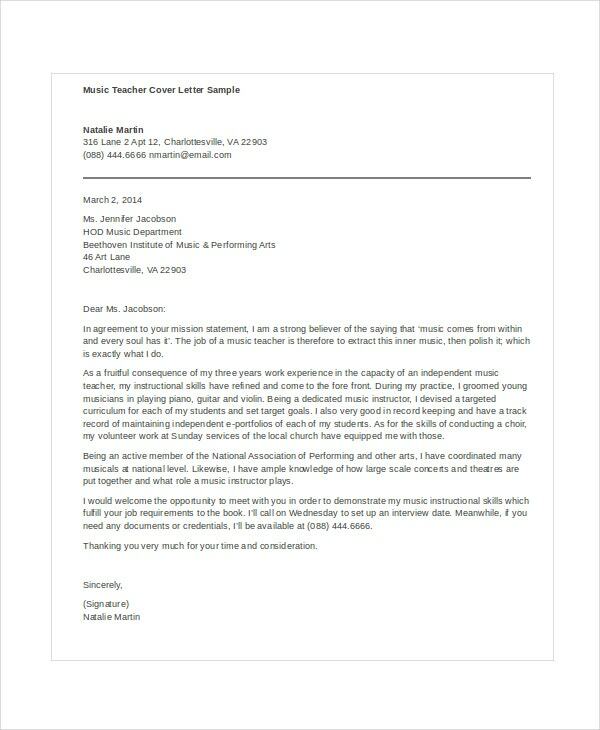 If you are looking to apply for a position of an elementary teacher then you can make use of this teacher cover letter example to write a cover letter to assist your resume. You can also see Teacher Resume Templates. 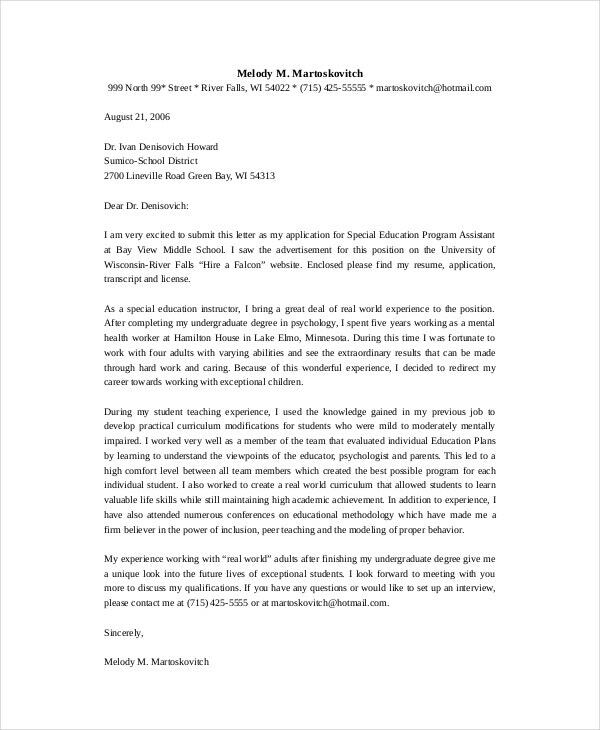 This is a teacher cover letter example that can be of great help to someone in writing a cover letter for applying for a position of a substitute teacher at a school. 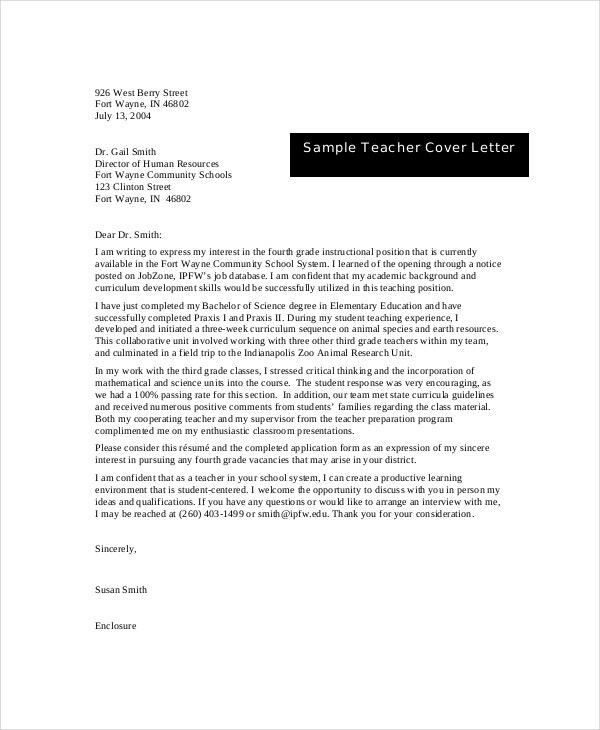 This is a teacher cover letter example which also contains a sample resume, both of which you can use as references in order to write your own cover letter for applying for a teacher’s post. You can also see Elementary Teacher Resume Templates. 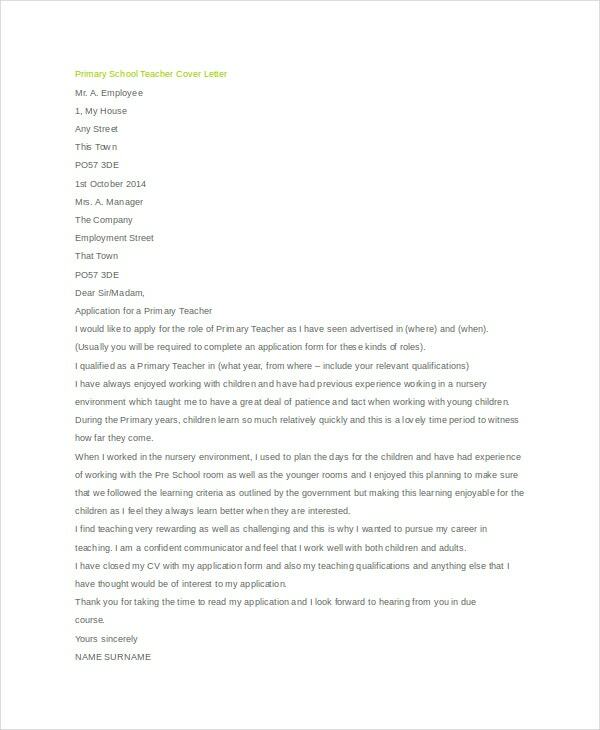 If you are looking to apply for a post of a primary school teacher and need help in writing a cover letter then you can directly make use of this teacher cover letter example. > Who can use the Teacher Cover Letter Examples? 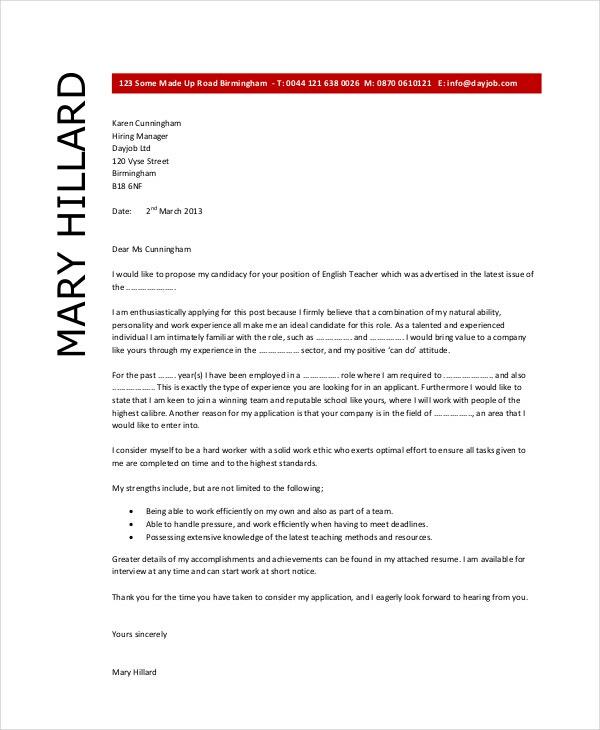 The teacher cover letter examples can be used by those who are applying for a post of a teacher. The templates are of various kinds and should be used depending on the type of job you are applying for. 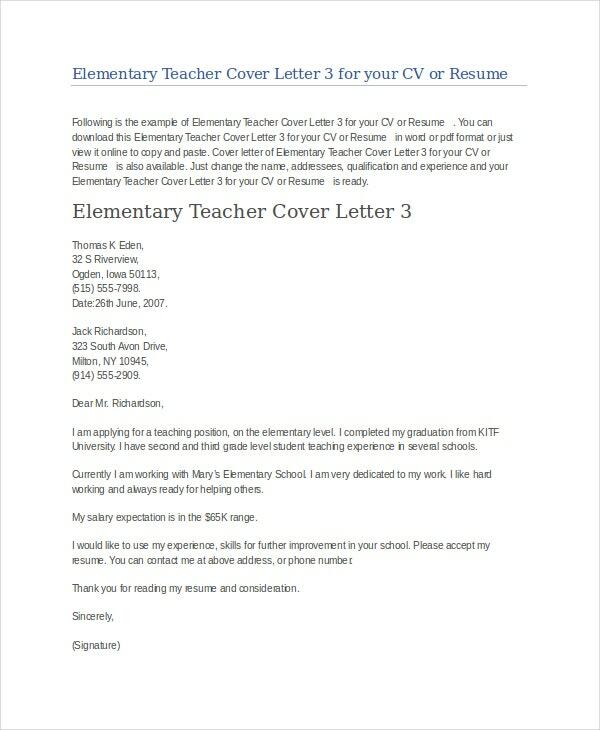 If you are applying for a post of an elementary teacher, then you should use the cover letter examples given for it. 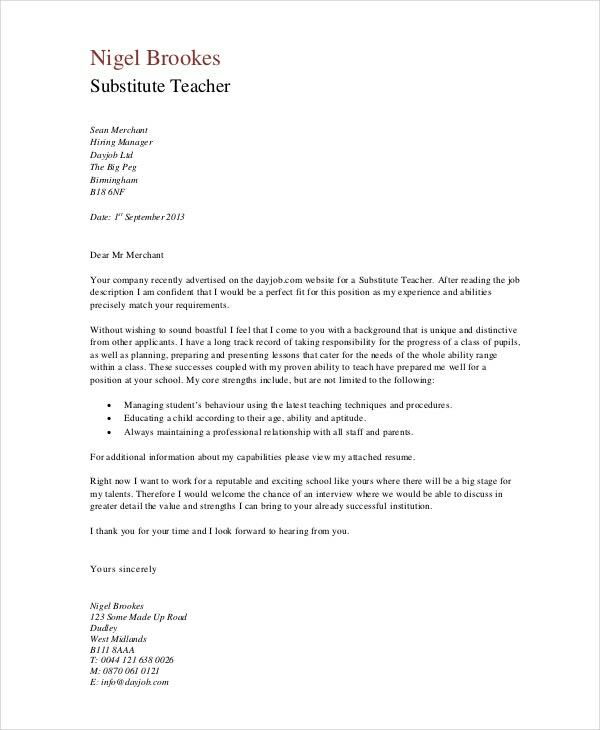 If you are applying for a post of a substitute teacher, you should use the cover letter example specifically provided for it. In a similar manner, you should use the cover letter examples which are given specifically for the post you are applying for. 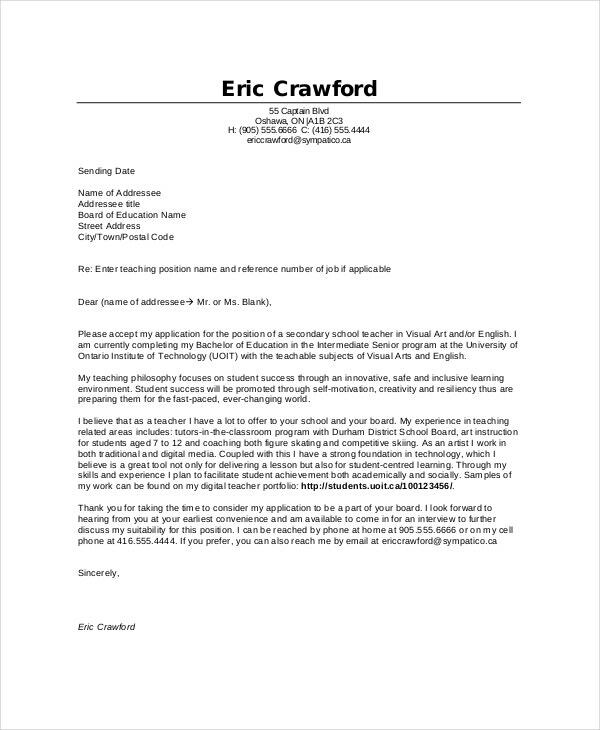 This is a teacher cover letter example that can be an extremely useful reference, especially for someone who is looking to apply for a post of English teacher at a school. > How to use the Teacher Cover Letter Examples? 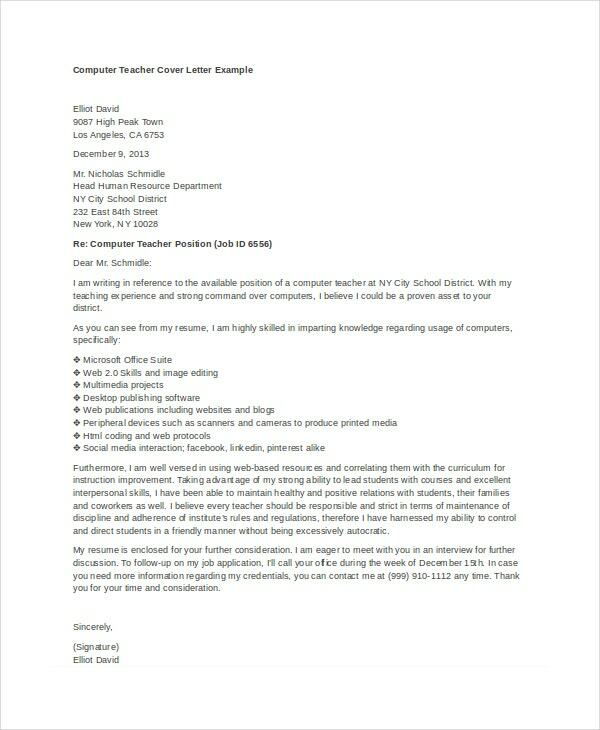 The teacher cover letter examples should be used as references in order for you to write your own cover letter while applying for a post of teacher. You should first choose the example that best suits the post you are applying for. Then you should carefully read the example. By doing this you will understand how you should write your own cover letter, what format to follow and what information about yourself it should contain. Some templates you can directly use by making a few changes in order to generate your own cover letter in just a matter of minutes. If you require help to write a resume for applying for a job of a teacher, then you can benefit by making use of teacher resume templates. A resume cover letter is very useful while applying for a job. Of all the various types of cover letter examples given above, you should carefully choose the one you decide to use for yourself.